Six Nations: Will domestic rugby row take Wales' eyes from the prize? Coverage: Live on BBC One, BBC Radio 5 live, BBC Radio Scotland, BBC Radio Wales, BBC Radio Cymru & BBC Sport website and BBC Sport app, plus live text commentary online. It was going so well. Three games played, three games won - the last a magnificent 21-13 victory over resurgent England. But days before the fourth leg of a potential Six Nations Grand Slam in Murrayfield and after the mother of all wins over England, Welsh rugby has been hit by the father of all domestic squabbles. The proposed and hugely controversial merger of the Ospreys and Scarlets is on one minute, off the next. On Tuesday morning the teams were merging and a new region emerging in north Wales. By Wednesday lunchtime Ospreys and Scarlets both said the deal was off the table. The Ospreys chairman Mike James has resigned in protest, and claim and counter-claims have been made in sternly-worded statements. Clear as mud. But what is certain is that 13 of the squad which Gatland announced for the Murrayfield match play for either Scarlets or Ospreys. Those players don't know who they are playing for next season. Or who'll be paying their wages. Or even where they'll be playing - Neath-Port Talbot, Carmarthenshire or north Wales. Others are out of contract and unsure of their futures. So as the faithful red and white, daffodil-toting hordes are preparing for the bi-annual trip north of Hadrian's Wall they might be wondering how the players can keep their eyes on the prize. Head coach Warren Gatland is a hard-headed New Zealander and is in charge of the team for the last time in the Six Nations. But even this arch pragmatist, forever a man with a plan, admits there has been an impact on the squad. "There is no doubt it has been a challenge for the players in the last couple of days," said Gatland. "The timing is not brilliant from our point of view, but that's what happens in professional sport. In fairness to the players, after the meeting, they are focused on Saturday." 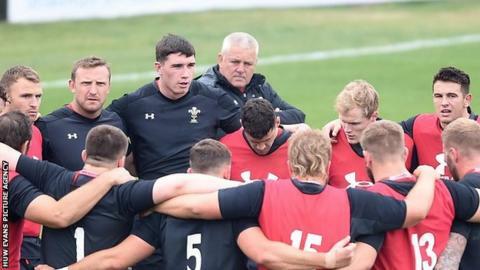 Conscious of the concerns of the players, the Welsh Rugby Union's chief executive Martyn Phillips met the Wales squad to explain plans for the reorganisation of the domestic game and put worried minds at ease. Did it work? Will the players use the row as extra motivation? "We have a special group of players at the moment and Alun Wyn Jones said that at the end of the meeting that our whole focus has to be on Saturday and preparing for the best way to play Scotland because we know what the challenges are and the potential rewards are massive. "Sometimes you have to have the ability in all walks of life whether it be professional or sport to put adversity behind you and focus on your job. "I am sure the players will do that and that's why we have come out and named the team early. "We wanted everyone to know we were on the front foot and ready to go." A view from outside the camp comes from Sean Holley, who coached the Ospreys and knows many of the players well. "They've got good leaders in there like Alun Wyn and Ken Owens, and I've just got a sneaky feeling that sometimes in adversity you can use it as a catalyst," he told the Scrum V Rugby podcast. "They are well aware this is a big, big game but I'm hoping and I'm confident it will galvanise the team." History beckons for Gatland. No coach of Wales has ever been in charge for three Grand Slams and, with 2008 and 2012 already under his belt, a hat-trick beckons. In normal circumstances, given their 12-match winning run and injury-hit Scotland's defeats by Ireland and France, Wales would start as strong favourites in Murrayfield. The question remains how much the off-field publicity will affect the team's performance on the field. Euphoria or despair? They're uncomfortable bedfellows. Williams (Saracens); North (Ospreys), J Davies (Scarlets), Parkes (Scarlets), Adams (Worcester); Anscombe (Cardiff Blues), Davies (Scarlets); Evans (Scarlets), Owens (Scarlets), Francis (Exeter Chiefs), Beard (Ospreys), Jones (Ospreys, capt), Navidi (Cardiff Blues), Tipuric (Ospreys), Moriarty (Dragons). Replacements: Dee (Dragons), Smith (Ospreys), Lewis (Cardiff Blues), Ball (Scarlets), Wainwright (Dragons), Davies (Ospreys), Biggar (Northampton), Watkin (Ospreys).